Watermelon is probably the most popular fruit for melon carving but there are many other colors of melons that can be carved. Honeydew melon with it’s green flesh and white skin is refreshingly pretty and easy to find year round here in the United States. Well, it certainly is in California. If you are looking for some inspiring watermelon carving ideas, photos and instructions, you’ve come to the right place. Check out 60 photos below. You can also get instant access to a free lesson right now. You will get OOOhhs and AAAAhhhs very soon. Some of the lesser known melons are also pretty for carving. Consider the yellow shades of casaba melon. Canary melons have a bright yellow skin that is pretty to carve. There are Casaba Melons, Sweet Kiss melons, and of course there is the soft orange color of ordinary cantaloupe flesh that has the inner green rind and the outer brown knobbly skin. Hami melons that can be found in many Asian markets have an interesting oblong shape which can add a nice contrasting shape when placed in a display with other melons. When you carve more than one type of melon and mix them together you get an especially lovely and colorful arrangement that is sure to impress your guests. You may be surprised that your carved melon arrangement gets so many Oooos and Aaaahs that it is the hit of the party. Photos are a great way to get some cool melon carving ideas. So, I’ve got over 60 photos that will give you some ideas. If you already have a lot of carving skills, these photos will give you some good ideas. 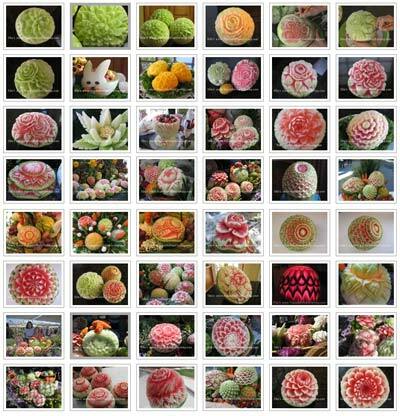 If you are new to melon carving, these photos will give you an idea of some of the carvings that can be done. Many are easier to do than they look at first glance. There are so many ways to carve melons. Besides your ordinary melon basket, melons can be carved into all sorts of beautiful flowers, swans, and decorative serving bowls, vases for fruit flower displays and much much more. With the variety of melons there are to carve, the possibilities are endless. 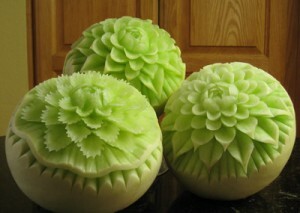 Learn Melon Carving and you will learn patterns that you can carve on lots of fruits and vegetables. What newcomers to the art of melon carving made easy may not know, is that the carving techniques used for creating stunning carvings can also be used to carve other fruits like mangos, papayas, pumpkins, kabocha and other squashes. Mexican papayas can be fun to carve because they can grow so large. 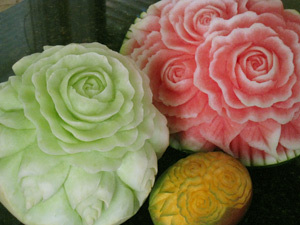 The same designs used for carving melons can also be used on vegetables like daikon, radishes, yams and even fat carrots. These root vegetables have the advantage of being fairly long lasting when stored correctly. This is definitely Carving made easy. When you learn melon carving made easy, you will find that you can carve many other types of fruits and vegetable with the same carving techniques and patterns used for carving melons. I attended a fruit and vegetable carving event where I competed and was very pleased to win the competition. One of the other fruit carvers asked me some questions about how I carved one of the pieces. Later he sent me some photos along with the following note. I am showing you this just to demonstrated how melon carving patterns can be applied to other fruits and veggies like Cinderella pumpkins. 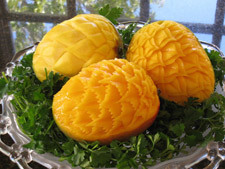 The mangoes shown in the photo on this page are another example of how carving patterns can be used with other fruit and vegetable carvings. “Here are some carving pictures which I learned from your carvings. These are 30 pound Cinderella pumpkins. 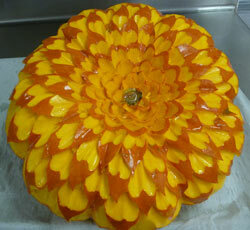 Chef Siddiqui saw my melon creations and applied those same designs to carving pumpkin. This is just one example showing how when you learn how to do melon carving, you are also learning techniques that you can use to carve a whole bunch of other fruits and vegetables as well. Here is a quick mini-lesson about peeling watermelon. If you would like a complete video lesson showing how to make a beautiful carved watermelon bowl, sign in above. To Get Your Free Melon Carving Lesson Right Now – Sign in Above. When you sign in, you will get instant access to a complete video lesson showing how to make an easy and lovely watermelon bowl that is not your mother’s ordinary watermelon basket. You will get ooohs and aaaahs when you bring this to your next BBQ or picnic. When you sign in, you will get instant access to other fun articles, photos and ideas. So, go ahead and get started. This is melon carving made easy! If you like this free lesson, you will love my Melon Carving lessons and my Carving Melon Flowers lessons. You might also like to learn more about my Watermelon Cakes that are sure to be the hit of any celebration.